For irrigating vegetables, flowers in your garden indoor and outdoor, it frees you 7-14 days for one time set, and keeps just the right amount of water in the soil. The water is absorbed through the clay as needed to keep the plant moist and not over-watered. The material allows for the right amount of water seepage. Waterer from pulling moisture quickly from the bottle. 1) Take any long neck glass bottle, such as a wine bottle, and fill it with water. 2) Set the Terracotta Plant Waterer on top of the bottle. 3) Flip them over and place the plant watering spike into your indoor or outdoor planter. 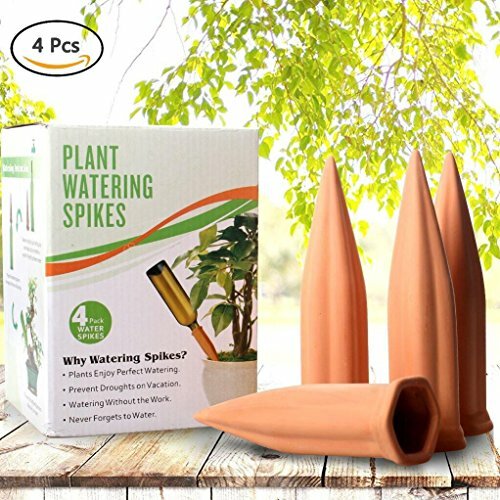 Easy to Operate: First, put the terracotta plant waterer under running water till it is fully saturated inside and out; then simply fill a recycled bottle with water, insert water spikes into the soil. Time-saving Automatic Watering Spikes: No need to think about watering your plants on a daily basis; use that extra time to do something fun. Portable Plant Watering Devices: An efficient, convenient watering system, excellent for keeping transplants healthy until their roots are established. Gift for Plant Lovers: Great gift for Mother's Day, Father's Day, Birthday, Boss, Bridesmaids.This self watering stake makes a perfect gift for first-time gardeners or potted plant owners. If you have any questions about this product by Swonuk, contact us by completing and submitting the form below. If you are looking for a specif part number, please include it with your message.